The Tesla Model S is a fascinating car from almost any angle. For example, the Model S is only the second mass-produced electric vehicle offered in the US (we’re not counting the Tesla Roadster or Mitsubishi i-MiEV or other limited production EVs by definition). It is also the first car designed from the ground up by Tesla Motors, the Tesla Roadster being an adaptation of the platform used for the Lotus Elise and Exige. Then there’s the fact that Tesla itself is a relatively new car company, helmed by Elon Musk of Paypal and SpaceX fame and headquartered in Silicon Valley, not Detroit, or Stuttgart, or Tokyo, or Seoul. Add it all up, and the Model S could be something new and different, or it could simply be a half-baked experiment. To check out the results of all this newness, we headed to Fremont, California where Tesla has taken over the old NUMMI plant previously used to build Toyota Corollas and Geo/Chevrolet Prizms as well as a few other models like the Toyota Tacoma. The facility itself is huge, clean and full of new production and test gear specific to Tesla. The drive that Tesla arranged was short, but we learned a lot about the car. The basic question with a new car like this really is something along the lines of “what is it?” Because the brand is new and the technology is new and the platform is new, consumers don’t have a basis for setting their expectations. You might not think that is a problem, but in our observation almost everyone imagines something about every new car regardless of his or her fact base. Get those expectations wrong, and you can be disappointed by a gem, simply because it didn’t fit with the concept in your imagination. To align expectations with reality, we think an understanding of the Model S is helped greatly by looking at the goals and decisions that the Tesla team had to make. Certainly the first decision needed was some direction on what segment to aim at. The Model S is a mid-sized luxury sedan, competing in price and size with cars like the BMW 5-Series and 6-Series Gran Coupe, Mercedes-Benz E-Class and CLS, and the Jaguar XF. The Model S, with the smallest battery, has a base price of $57,400 before the $7500 federal tax credit (or $49,900 net). Larger batteries add $10,000 or $20,000 to this price. The top-of-the-line Performance model lists for $92,400 and includes inverters that increase acceleration, as well as an air suspension and sophisticated trim. Tesla needed a category with lots of buyers, because other aspects of the Model S will limit it to a fraction of those buyers. It also needed a category where premium pricing is common, because electric vehicle technology is still expensive, and Tesla doesn’t yet have much volume or many alternative platforms across which to spread development costs. That decision seems pretty straightforward, and it probably didn’t occupy the pulsing brains of the plethora of Stanford, Cornell and MIT engineers running around Tesla HQ for more than a few minutes. Where it starts to get interesting is when we consider the choices needed in the styling of the Model S. Basically, Tesla decided to make the Model S look good. While that might seem obvious, stop for a second and observe that the most successful alternative drivetrain vehicle, which accounts for around half of all hybrids sold, is the Toyota Prius, and then consider that Toyota decided not to make it look good, but to make it look distinctive. If you are paying a premium price for something, and you’re doing that because you want to make a statement, then distinctive has advantages. Tesla didn’t try to be terribly distinctive, and we think it probably made a wise move here (only time will tell since human behavior is remarkably hard to predict). In the social class relevant to $60,000 to $80,000 cars, driving an obvious billboard is somewhat déclassé, as you might imagine. Of course, BMW and a few others have flirted with “more distinctive than beautiful” approach to their upper range cars, but they at least might have the brand power to pull it off (and even so have retreated from the approach). In the flesh, we thought the Model S looked even better than it does in pictures. The shape is attractive, and the car is slightly smaller and sleeker than we had imagined. The design details for the most part fall in the classical realm, Tesla having decided to assiduously avoid almost anything really controversial on the exterior. The only things we noticed that run outside the norm are the door handles, which are flush to the body when the car is rolling but extend when you put the car in park, and the wheels, some of which have a slightly techy design. That’s pretty conservative stuff. On the inside, the Model S continues the attractively conservative theme. Materials and shapes are nice, and we’d say the color choices are a step ahead of what many European brands offer in subtlety and harmony. The big news on the inside, though, is the 17-inch touchscreen. Tesla has opted to replace the entire center stack with a single, huge LCD. This allows a few things to happen. First, many, many controls and data panels can be offered, but in fairly simple screens (think of an iPhone). Second, the controls can be customized to the user. Third, as Tesla figures out better user interface layouts, your car can be updated. Fourth, Tesla can really make a mess out of some features because their software engineers have so much freedom. If the experience of most automobile companies is any indication, the Model S interface will be a combination of the brilliant and the idiotic for a while. The real test will be how long “a while” is. Next up, the designers had to make some packaging decisions. That’s a bigger deal than you might imagine, and is something those fancy engineers we mentioned previously took pretty seriously. One of the reasons packaging is a big deal is that an EV allows for a different arrangement of components than car buyers are used to with internal combustion based cars. In the case of the Tesla, there is no engine or power unit up front (there is a trunk under the hood) because the battery is flat and in the floor, and the electric motor is tucked behind the rear axle. Once Tesla understood how different things could be in terms of layout, it added some functional requirements to the packaging objectives for the car. It made the Model S a 5-door affair, like the Porsche Panamera. It also added an optional rear-facing third row of seats so that some families with smaller children could use the Model S as a seven-passenger car. Others will view this as a station wagon substitute because the rear seats fold down and the load floor is pretty capacious and accessible. The styling brief and the packaging brief do come into conflict in the rear seat area, however. The sloped roofline that looks so sleek cuts into headroom, just like it does on the Mercedes-Benz CLS. And the passenger cell is pushed back in the wheelbase to give the Model S rather nice proportions, but with the result that ingress to and egress from the rear seat are slightly more gymnastic than some people might like. If your rear-seat passengers are less than five-feet, ten-inches tall and have an athletic mindset, you’ll be fine; otherwise, caveat emptor. The element of the body design that isn’t obvious until you drive the car is the structural integrity of the chassis. Tesla swung for the bleachers on this one because it realized that the battery cell gave them advantages in creating very high torsional rigidity. That might seem geeky, but a stiff car can have a better combination of ride and handling, all other things being equal. When we headed out onto the road, the sense of solidity in the body structure was impressive. The car feels as if it was carved from solid billet aluminum rather than assembled from pieces bolted or bonded together. To fully assess this we’d have to do some back-to-back comparisons on the same roads, but for now we’ll just say that we can’t think of another car that is obviously more solid than the Model S.
To go along with this solidity, Tesla has delivered quite good ride quality. To understand this, a little context is in order. The Model S has a moderately firm ride and very good roll control. If you have driven other cars in this class, we’d say the Tesla is softer than an Audi A6, similar to a BMW 5-Series, and slightly firmer than a Porsche Panamera. We didn’t have a lot of time on bad roads, and we were in California not the Northeastern US, but we’d say the Tesla ride quality is about equal to the best of those cars (the BMW) and perhaps better. When we talk about ride quality, we’re talking about subtle differences where your opinion of different cars might vary from road to road. But when it comes to quiet, there’s really no contest. 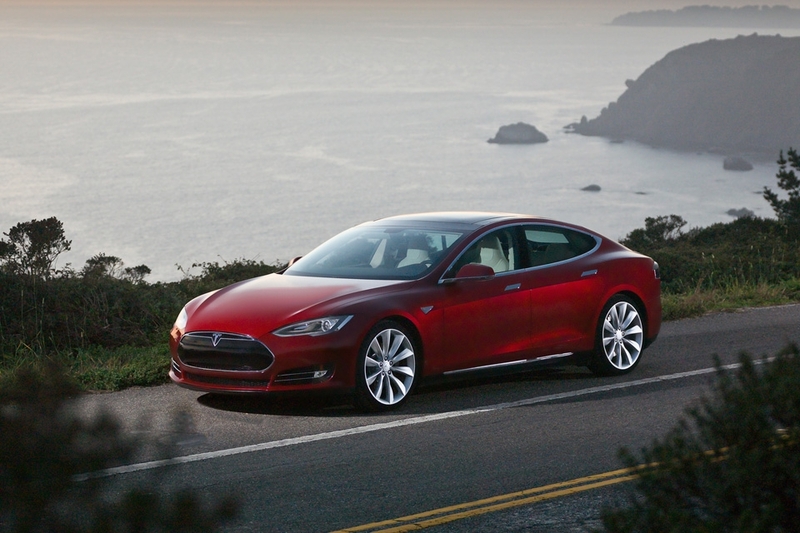 The Tesla Model S is simply and obviously the quietest car in its class. Again, a little context is in order. You may have read that EVs like the Nissan Leaf or Chevrolet Volt are quiet. We’d say that’s literally nonsense. The Leaf and even the Volt are moderately noisy cars, but they lack some of the sounds we are used to from internal combustion engines. The sound signature is different in these cars, but they are only slightly quieter overall than their conventional category peers. You might think of it this way: if heavy metal bands normally did their concerts at commercial construction sites, when we unplugged the band, the whole affair would sound different and quieter, but it wouldn’t be quiet. With the Tesla, the sonic starting point is luxury sedan (think Lexus) structural quiet, and then Tesla has removed the internal combustion sounds. This still lets you hear tire noise and wind noise, and since there really isn’t much else to hear you hear those sounds more clearly. So, we have to admit the search for quiet is somewhat elusive, but circa 2012 the Model S is about as good as it gets. In terms of standard driving dynamics the Model S comports itself well. The car feels rather heavy (and at 4647 pounds, it is). Again the Porsche Panamera comes to mind, which is another car that feels luxuriously massive. Fortunately, the Model S handling is very nicely controlled, with well-damped body motions and very flat cornering. The steering weights up nicely, though we don’t know that there is much feedback on offer. The two big things we noticed were that fast transitions were quite fun because the car isn’t sloppy, but daily driving might be slightly dull because the car isn’t very talkative (that well-controlled chassis again) and there are limited driver inputs, something that seems endemic to any EV. Another dynamic element that stems from the drivetrain is, in a word, torque. 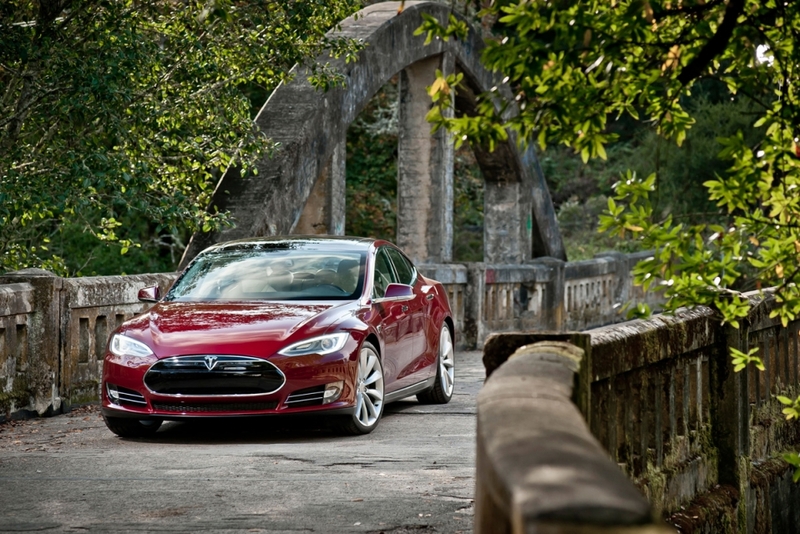 EVs deliver maximum torque at low speeds, and as a result, around town the Model S is a hoot. We drove the Performance version, so this is best case, but the car jumps from stoplights and accelerates brilliantly at urban speeds. For reference, Tesla quotes 4.4 seconds as a 0-60 mile-per-hour time, and 5.6 to 6.5 seconds for the other models depending on battery size. The Model S doesn’t feel supercar fast, and the quiet described above ameliorates some of your sense of velocity, but still this thing moves well. Think Porsche Boxster S or Nissan 370Z and you’ll have something of the idea, though power delivery is different. Which brings us to the second word about the Model S drivetrain: immediacy. As with a car using a clutch-based transmission, the Model S has little to no slop when you dig into the throttle. Improving on that, the Model S has only one gear, so when you punch it, there is almost no delay while you or your microprocessors change gears. This arrangement is better than a manual or an automatic for immediacy, and when coupled with electric low-end torque, it adds up to a car that is simply more responsive in normal driving. So, if you get the idea that we enjoyed our brief stint in the Model S, you’d be right. But, we need to leave you with an important thought. The Model S is basically a mid-sized luxury sedan with some sporty characteristics allowed by the EV drivetrain. It is not an M5 competitor. The Model S starts with the goal of being a car for people whose ideal focuses on comfort and tranquility, not involvement. If you think about it, the body control and drivetrain immediacy that sound sporty are also comfort improvements, because sloppiness is annoying and distracting. So, it may turn out that Tesla has built the ultimate Lexus. That would be a tremendous achievement for anyone, and is even more impressive for the first full car design from a new company. But don’t be confused, the Model S is not a Tesla Roadster with four doors. 1. Range is a natural concern with EVs. The fact is that if you want to go more than a few hundred miles per day, EVs are tough to live with. Yes, there are public charging stations, but you really have to plan your route carefully to use them, and at this stage that is a hassle for most people. That said, many drivers don’t go more than 100 or 150 miles in a day (less than 40 miles is an average commute), and most of us know when we’ll be travelling long distance, so a second car can be used. 2. The Model S is offered with three battery sizes. These batteries offer range of 160, 230 or 300 miles. Our experience with EV range claims is that they are best case, so we might suggest viewing these numbers as 130, 190 and 240 miles, at least until some real world testing can be done. 3. Tesla quotes a charge time of 62 miles per charging hour with their 240-volt charger.